Coming Soon: Christmas Jumper Day Competition! That’s right folks! 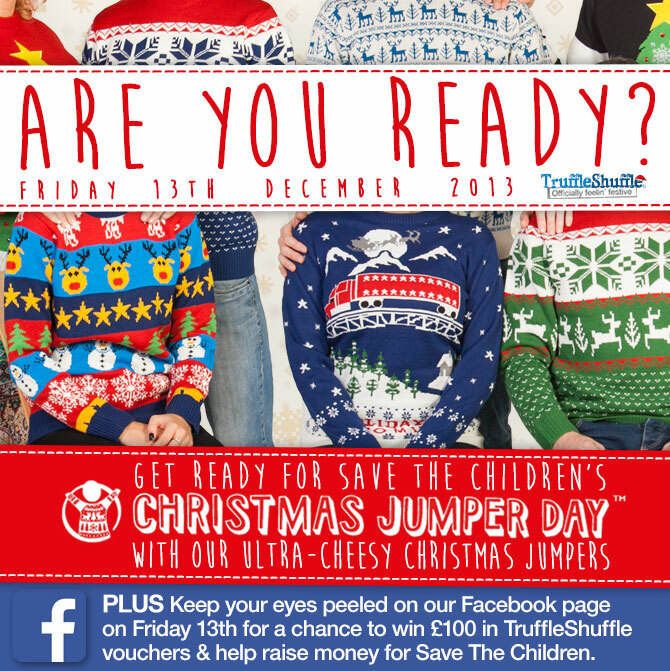 It’s time to ‘Make The World Better With A Sweater’ as we’re just a few days away from launching our big Save The Children’s Christmas Jumper Day competition, giving you lovely lot the chance to win a massive £100 to spend at TruffleShuffle.com just in time for Christmas!! Kick-starting this Friday (13th Dec), we’re searching for your best, most embarrassing, most creative or simply super retro Christmas Jumper piccys taken by yourselves. The more wacky or funny the better! Plus – for every pic uploaded, we’ll be donating £1 to Save The Children so there’s really no reason not to get involved! Full details on how to enter and how long you have will be posted on Friday so stay tuned and get snapping your best Christmas jumpers piccys in preparation. Not got a jumper yet? Check out our full range available with next day UK delivery by clicking on the big picture above or heading over to TruffleShuffle.com now. Stay tuned and let the fun begin! Previous PostPrevious Your Secret Santa Sorted! Next PostNext Our Top Sesame Street Spoofs! Ladieswear	Our Top Sesame Street Spoofs! Brands	Your Secret Santa Sorted!